Professionally Manufacture Wholesale Clamshell Screen Printing Machine,Accurate Clamshell Screen Printing Machine,Electrical Clamshell Screen Printer,Semi Automatic Clamshell Screen Print Equipment. The Clamshell Screen Printing Machine,Accurate Clamshell Screen Printing Machine,Electrical Clamshell Screen Printer,Semi Automatic Clamshell Screen Print Equipment totally uses electrical power for inking and silk screen printing etc. It doesn't need the air compressors any more. It saves energy and doesn't make noise. This machine is widely used to the imitative metal inks printing on packing material such as cigarettes, wine and cosmetic etc, as well as on the printing of signboards, road signs, advertising boards, posters etc. The printing table uses imported stainless steel plate which is flat and smooth, and can be adjusted right and left back and forth to achieve the accuracy printing. The Printing inking force and speed can be adjusted easily and convenient. 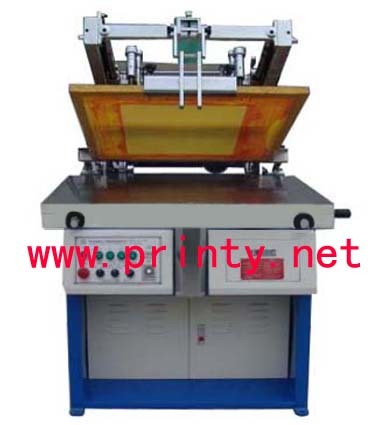 It has synchrony and mechanical screen-peeling facility to ensure the clear and beautiful printing result. It has manual, semi-auto, auto, ESD and reset functions to ensure the safety and reliability of printing operation.